We know — picket fences are often associated with the long white fence that Tom Sawyer had to paint. At Apple Fence Company, however, we strive to change how people think about a picket fence with our ornamental iron picket fences. Made out of wrought iron, our ornamental iron picket fence is a durable and elegant way to keep your Austin home or business secure without sacrificing landscaping or architectural views. Customers can opt for decorative finials or change the look of their ornamental picket fence as they see fit. Apple Fence Company is committed to providing quality craftsmanship. That is why your custom picket fence order is constructed entirely in-house. Unlike other fencing companies, we won’t keep you waiting for a shipment from a third-party manufacturer. Instead, we manufacture our own iron custom pickets and pressed spears at our manufacturing center in Leander, Texas, where we have control over each step of the process. The end result is a quality custom picket iron fence that meets each of your needs. 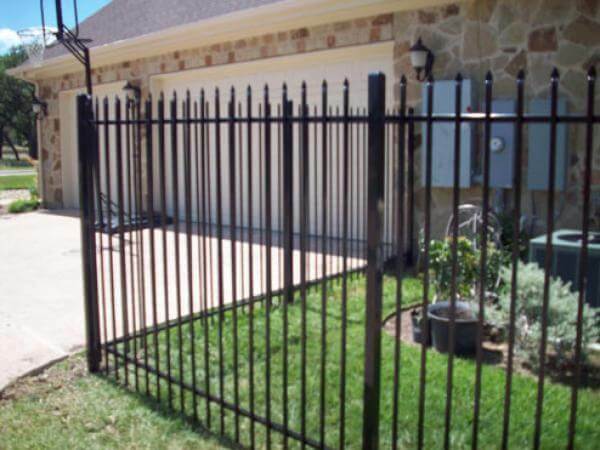 If you’re looking for ornamental iron fence installation in Austin, Texas, contact our iron picket fence professionals for a free quote. We have over a decade of experience installing extended picket wrought iron fences in Leander, Round Rock, Georgetown, and Pflugerville, Texas.